A large proportion of our blind and curtain work is for the modern healthcare and education sector, but that’s not all we do. Our curtain making department are also expert in making curtains in the classic style. Recently a prestigious London client asked us to replace curtains in their meeting room. The new curtains had to match the old ones, if this had been a hotel we’d be talking 5 Star or above. 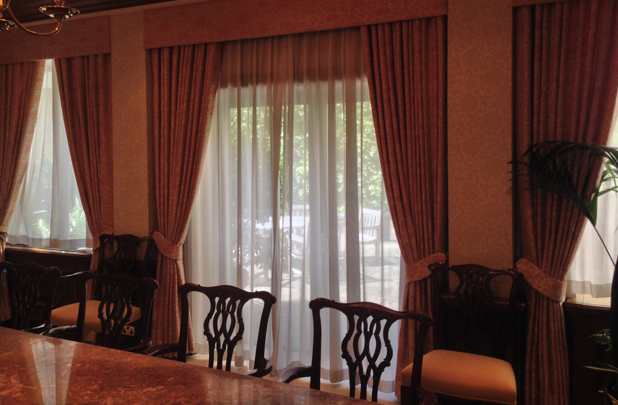 We measured up, sourced a designer fabric very close to the original and proceeded to recreate the curtains. They are completely hand stitched (no machine work) pencil pleat curtains with black-out and inter-linings, pelmets, tie-bands and voiles. The client was not just impressed with the finished product, but also commented on how very happy they were with our fitters.